The morning of the 9/11 Memorial 5K, Preston and I had the privilege to greet arriving World War II veterans coming in on honor flights from Florida and Indiana. To then end the day with a race in honor of all the men and women who not only lost their lives on September 11, 2001 but also honor all those who have served overseas in the aftermath of 9/11, including my husband, was an emotional experience that I’ll never forget. 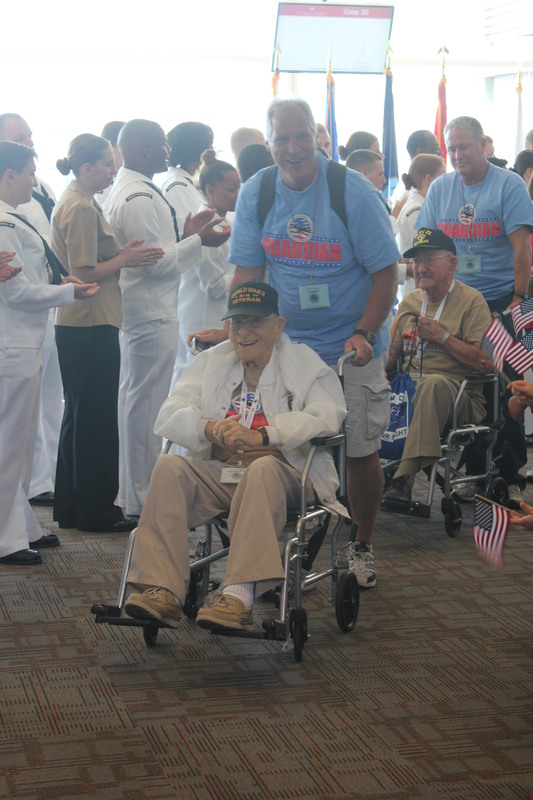 One of the many WWII vets that we greeted at the airport. They were so happy to be able to spend the day in DC, which included a stop at the WWII Memorial. 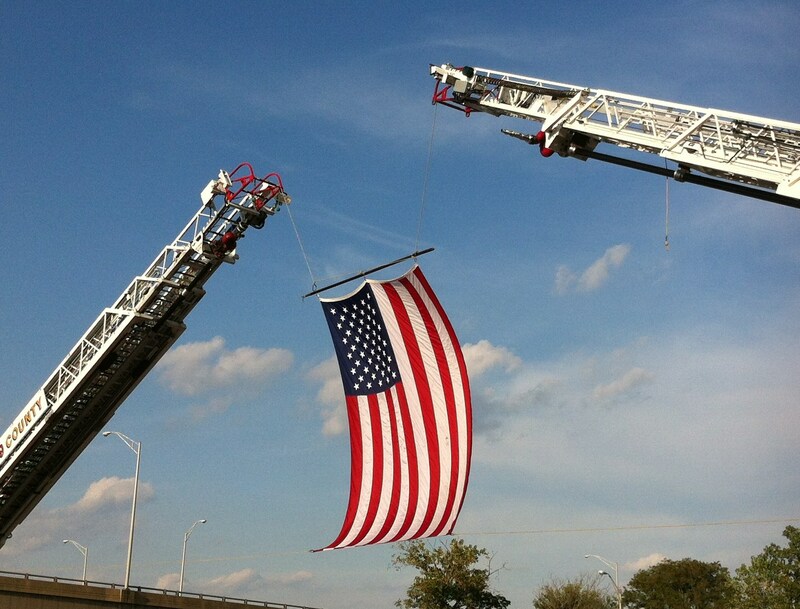 When we arrived at the Doubletree Crystal City, which was where the race both started and finished, I was flooded with emotion as I saw Arlington County and Fairfax County firetrucks with an American flag proudly hanging from the extended ladders. It was the perfect sight to see as race time approached, to run in front of as the race started, and to see as you approached the finish line at the end of the race. 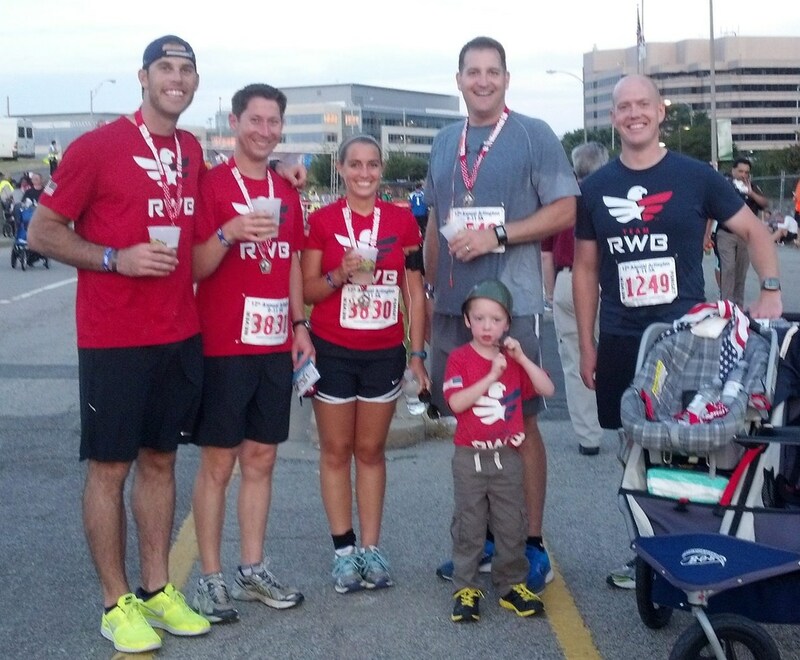 Prior to the start of the race, Preston and I met up with other members of Team RWB. Like at many other races that Team RWB participates in, a couple team members took turns carrying the flag during the race. As the 6:00pm start time approached, we were serenaded with a beautiful rendition of the Star Spangled Banner. 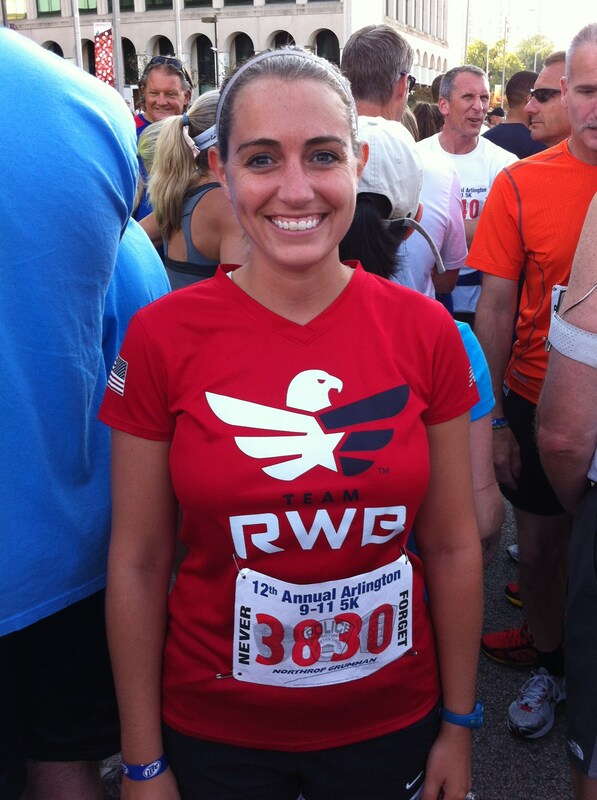 Although this is a traditional kickoff to most races, there was something about hearing it among the presence of so many American flags, including the one that our Team RWB chapter captain was holding, that brought even more emotion about what the purpose of the race was. Just after 6:00pm, the gun sounded and we were off. Because race capacity was capped at 4,000 people, it was very easy for us to start close to the front of the pack. This allowed for minimal weaving, which of course was a great time saver. The 5K course took us on a loop around the Pentagon. Along the route, we passed one of the local high school marching bands playing patriotic music, as well as a group of bagpipers. You could tell that everybody out at this particular race was focused on honoring those who died on 9/11 as well as those who have died in battle defending American freedom, and that only further fueled the emotion that I felt during this race. 1. Run below an 11:00 min/mile pace. I was especially focused on this goal since this was the same goal pace that I set for myself for the Rock ‘n’ Roll Virginia Beach Mini Marathon that I didn’t meet. I came much closer at this race in meeting that goal, but the hill during the last half mile of the race slowed me down much more than I anticipated and I finished the race in 34:20 (11:04 min/mile pace). I was just off of my goal pace! 2. Use milestones to help focus on my running and take my mind away from trying to talk myself into the need to walk. My use of milestones certainly helped me in completing this race much faster than I ran in Virginia Beach. I initially focused on getting to the first mile marker, then the water station, then the second mile marker, etc. I walked less than I did in Virginia Beach (didn’t walk for the first time until I reached the water station! ), but it was hotter than I thought it actually was prior to the start of the race, which slowed me down a bit. Because this race was a 9/11 tribute, I ran to raise funds and awareness for the Wounded Warrior Project through Charity Miles. The big lesson that this race emphasized for me was the need to study the course prior to race day. Since I had seen on the course map that we’d be running a loop, I knew to keep to the right of the course for the majority of the time that I was running. It wasn’t until the last half mile of the race that we shifted to left turns, but I knew this in advance and was able to plan accordingly. After the race, Preston and I linked back up with other members of Team RWB for a meal of pizza and beer (there was also other food available, including hot dogs, hamburgers, and fruit). We stayed long enough after the race to be able to see the fire trucks pulling their ladders in and taking the American flag that had hung from the ladders down. I couldn’t have planned a better way to end our patriotic day and reflect on how much our veterans mean to this country. This entry was posted in Races and tagged 5K, Arlington 9/11 Memorial Run, Charity Miles, goal, running, Team Red White and Blue, Wounded Warrior Project. Bookmark the permalink.